Easy-to-Use Location Search for WordPress Simple enough for plug and play, flexible enough for a customized location search solution. Optionally set your own post type and latitude/longitude fields. This is ideal for developers who need a way to provide location search with existing data. Choose any existing post type to search. Choose existing latitude and longitude fields. Preconfigured “Location” post type comes packaged with required fields. Ideal for an “out-of-the-box” location search solution. Address automatically geocoded on save, using Google Maps’ geocoding API. 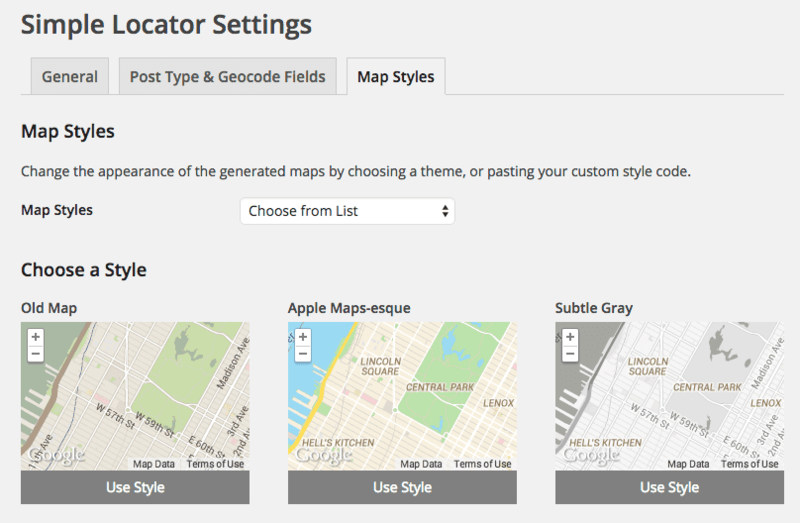 Choose from an included list of map styles, or use your own custom styles. Includes a wide variety of pre-configured styles to choose from. Developer friendly – use your own Google Maps API formatted style array for full customization over the appearance of your maps. Option to upload a custom map marker (pin). Additional customization options available using shortcode parameters. Already have a post type with latitude and longitude fields? Unlike other store locator plugins, Simple Locator allows you to specify your own data sources. Easily embed and customize search forms using the Simple Locator widget or shortcode. Simple locator requires PHP version 5.4.0 or above, and WordPress version 3.8 or above. The plugin will not install on setups that do not meet the minimum requirements. addresslabel="U.S. Zip Code or City"
Options include the title, distance options, and the map height. To use the widget outside of a predefined sidebar area, use the following function in your template, as outlined in the WordPress documentation. The widget name is SimpleLocator\Widgets\Form (must include namespaces). By default, a map of the location is added to the content on singular views. To remove this feature, update the setting under Simple Locator > General Settings. The following shortcode displays a map for a single location. If no post id is provided, and the shortcode is used on a singular view template, the current location will be used. To display a map with all locations, use the shortcode [simple_locator_all_locations]. Important: If your database contains a very large number of locations, using this shortcode will result in a slow page load. This functionality is best reserved for sites with a limited number of locations. 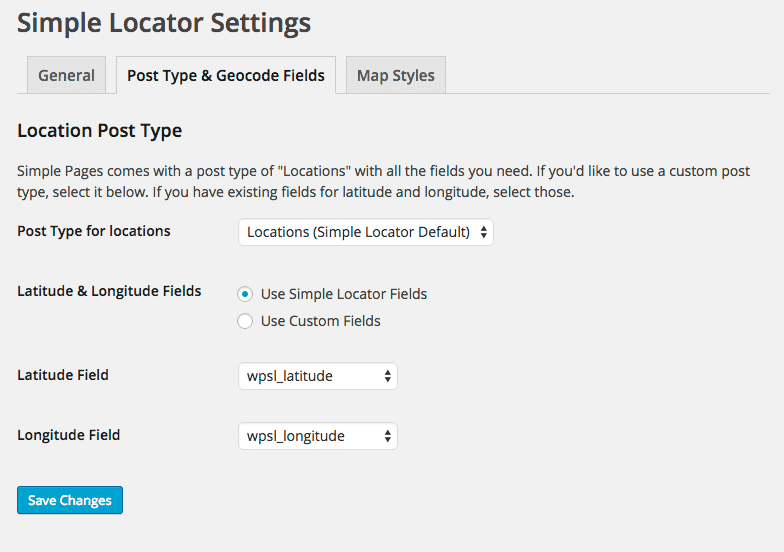 To access Simple Locator’s settings, choose “Simple Maps” from the “Settings” menu in the WordPress admin. An API key is not required, but strongly encouraged. This will allow you to monitor your usage of the API and possibly prevent restriction due to being over API limits. API keys are free and available through Google’s developer console. An API is required to use the plugin’s import functionality. The importer requires a server key with the Geocode API enabled. Learn more about how to obtain a Google API key. Choose between miles and kilometers. Defaults to miles. Upload a custom map pin image. The recommended image format is a transparent PNG. To disable the Simple Locator CSS choose “No”. If you are using another plugin that includes the Google Maps API, it is a good idea to disable the output of the API. Setting this to “no” removes the Simple Locator generated Google Maps script tag. Enables autocomplete functionality in search inputs. The autocomplete functionality is provided by Google’s Places API. View an example of Google Places autocomplete. By default, an embedded map is added to the content on location singular views. To remove the map, select “No”. For customized templates, disable this feature, and use the provided single map shortcode where needed. Add a “use my location” button on geolocation-enabled devices/browsers. The button will not display on devices/browsers without geolocation capabilities. Customize the text in the location button. A common UI element for these buttons is the “target” icon – HTML is permitted. Select the post type for location searches. For searches to work, the selected post type must have associated latitude and longitude fields, formatted in degrees. Select existing custom fields for latitude & longitude if required. Field choices are dependent on the post type selected. Customize the included “location” post type. The name and slug should be all lowercase with no spaces or special characters (they must follow the WordPress post type naming conventions). If the post type name or slug is updated after data has already been saved under that type, it will not be accessible under the new name. By default, maps are displayed in standard Google Maps styling. 2 additional choices are available to add custom map styling: choose a pre-formatted style, or paste your own. Select the pre-formatted style for easy custom styling. Sometimes you may want a map to display on page load, before the user has submitted the form. Additionally, it may be desired to have results automatically load based on the user’s location on page load (without the user submitting a form). These options may be enabled and configured under this tab. Enables the default map to show. The map’s location and zoom level will be saved. To automatically request the user’s location, center the map at that location, and search for locations nearby, enable this option. Note: The default map must be enabled, and the user must allow access to their location manually for this to fully function. If the user does not have location services, or they deny access to their location, the default map will be shown. Results may be customized to include any of the chosen post type’s custom meta fields as well as post data. Options include the distance (will display in the chosen format – km/miles), show on map (displays a link that when clicked, scrolls to the location on the map), and all meta fields associated with the selected post type. Includes the title, permalink, excerpt, and thumbnails. Thumbnails are selectable per size registered. To show unlimited results, set the number to -1, otherwise, set the maximum number or results to return. Will this run on any WordPress site? Simple locator requires a minimum of PHP version 5.3.2, and will not install if this minimum requirement is not met. If you are unsure what version of PHP your server is running, contact your hosting provider. What 3rd party services does this plugin use? Can I hide the map, and only show text results? Use of the Google Maps API requires that the data be displayed in a Google map. Hiding the map violates the API licensing. How do I add custom functionality to the generated maps? Is my existing data automatically geocoded? No. If an existing post type is chosen as the search term, there must be preformatted latitude and longitude fields associated with each post. All new posts under the “location” post type are geocoded on save. I need custom functionality, how do I get it? Use the contact form on this page to submit a request. If the functionality makes sense to include in the core plugin, we’ll place it on a list for future release development. If not, we may be able to provide some guidance on how to achieve what you’re trying to accomplish. Simple Locator has a powerful API with filters for just about everything, including SQL queries. Does it work outside the United States? Absolutely. 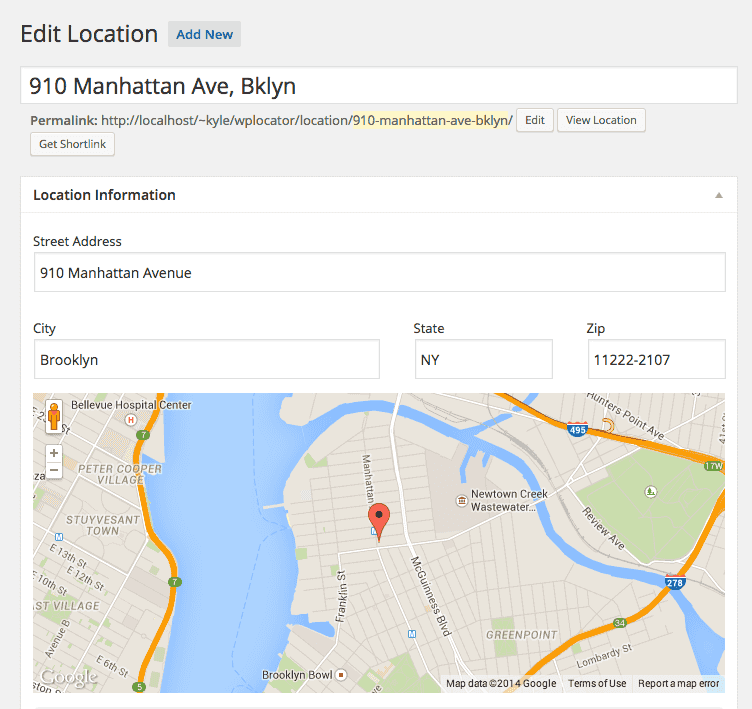 The search form uses the Google Maps API geocoding service, which offers reliable data throughout the world. Localization is possible using the provided POT files in the /languages folder. Will this work on my non-SSL enabled site? Maybe. Google recently updated the geolocation capabilities within chrome to only work on SSL enabled sites. If you’re using the “Use My Location” button included with the plugin, you will need SSL on your site. You will also need a verified SSL site to use the CSV importer. Can I use multiple post types? No. Simple locator allows you to set one post type for locations. This can be the included post type, or your own, but multiple post types are not supported. Why does it take so long to import locations? Google throttles their geocoding services to 5 requests per second. How do I get my form and map to look/work like yours? I need a special feature and I want to pay you for it. I am not available for contract or for-hire work. Will this plugin work for [insert special case here]? I would recommend downloading and installing the plugin and testing. Before submitting a form, please review the frequently asked questions above.